Meet the successor GSM LT-2 ! The GSM LT-2 communication module makes it possible to use GSM paths to provide monitoring and messaging functions in alarm systems. 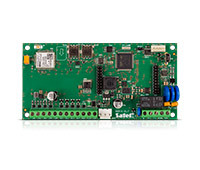 It facilitates cooperation with SATEL and third-party control panels offering connectivity by means of control panel diallers or correctly configured outputs. The GSM LT-2 module makes it possible to implement monitoring as well as text and voice messaging functions. The CallerID retransmission function makes it possible to present the incoming caller's number on telecommunication terminals equipped with this functionality.